Colin Dexter was born in 1930 and, over the course of his writing career, has won CWA Gold Dagger and Silver Dagger awards. "Last Seen Wearing" was first published in 1976 and is the second book to feature the famous Inspector Morse. 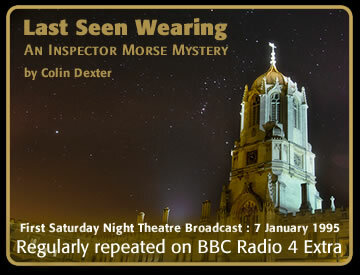 "Last Seen Wearing" sees Morse and his sidekick, Lewis, assigned to a missing persons case. Just over two years previously, Valerie Taylor - a seventeen year old pupil at a local comprehensive school, had disappeared. The case had been investigated by one of Morse's colleagues, Chief Inspector Ainley, but was never closed. Morse has now inherited the case following Ainley's death in a car accident. Although technically a "cold case", it was one that Ainley had never stopped investigating - albeit unofficially and in his own time, in the latter stages. Ainley was returning from London when he had his car accident - Morse believes he discovered something important there. The day she disappeared, Valerie had come home for her lunch - although she left to return to school for her afternoon lessons, it seems she never arrived there. However, a letter has now arrived home - apparently from Valerie, saying she's fine but doesn't want to be found. According to the postmark, it was posted in London the day after Ainley's death. Morse, for no clear reason, decides that Valerie is actually dead and the letter is a forgery. Since Valerie disappeared on the way back to school, Morse and Lewis naturally look into her school-life. Three staff-members, as it turns out, crop up regularly in the investigation. One is the school's headmaster - who had only been appointed to the position three years previously. (From the book's prologue, there's a suspicion he may have had a quick roll in the hay with Valerie on the day of his interview. Naturally, he wouldn't have known she was one of his prospective pupils at the time). Phillipson is still relatively young - he's only in his mid-thirties and is married with two young children. The school's vice-principal, on the other hand, is a single man in his fifties called Baines. He'd been passed over by the school's Board of Governors for the headmaster's position, and it's clear that he and Phillipson don't get on well together. The final staff member is David Acum, who had only taught in the school for one year - leaving shortly after Valerie had disappeared to take up a teaching position in Wales. Acum had taken Valerie's last class before she went missing. Ultimately the clue to solving the cases lies in the possession of a rather maundane object. The clue is under everybodies nose yet njo one can see it proving yet again how valuable your buildings and its contents can be. Even though we are with Morse through every step of the investigation, in the end he is still ahead of us. Even when he has the clue ion his possession, we still cannot see it. While it's a better book that "Last Bus to Woodstock" - the first in the Morse series - there are still plenty of flaws in "Last Seen Wearing". Despite working on what was officially a missing persons case, it seemed strange that Morse had no clear photo of Valerie's face - the clearest shot mentioned appeared alongside a newspaper article. I was a little puzzled how Morse was supposed to recognise Valerie if he found her. I also found it strange that Morse didn't spend more time talking to Valerie's school-friends - only one of them, an ex-boyfriend, is even mentioned. Later on, when a murder is actually committed, Morse removes the weapon from the corpse and tosses it aside - taking no interest in fingerprints or forensics. (At this point, I was wondering how he still had a job). Dexter's style of writing didn't do much for me either - "I wish we could be naughty together, don't you ?" and "Watch out you miserable sinner, whoever you are, who did poor Valerie in !" are just a couple of samples. Largely an easy read, though it's no classic.